Very exciting things are happening on the Australian ufology scene, for once. 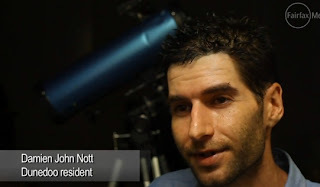 In spite of the many bumbling and clueless Australian "ufologists", Mr Nott is doing something pretty amazing. He is filming "objects" repeatedly, often with other people around him. Damien is like a cross between Ted Serios and Stella Lansing in that the ufo engima appears to be "attracted" to him. We are unaware of anyone else in Australia that can go to different locations, and keep getting bizarre stills and even stranger videos. A couple of his more average videos are on his youtube channel here. The Sydney Morning Herald actually did a story and him and their reporters did see some odd things in the sky .Here. At first, a few ufologists arrived at Damiens home and squabbled amongst themselves when they first met him. They filmed some ufo`s near his home at Dunedoo and then promised to send him the footage, which was a lie. They then "leaked" comments he had made to some of them in private. Another group was quite happy to allow Damien to "entertain" them..at Damiens expense. Yet until prompted, never tried to help him with equipment costs. They then bragged about helping him at a Ufo meeting. Seriously, they have no shame here. Most ufologists here are more concerned about collecting reports/promoting con artists etc..than the sort of real work that Damien is involved in. ! Most "ufologists" here dont seem to understand that no one knows what "ufo`s" actually are. They automatically think they know and think it means ET are here checking us out. Its an acronym which does not mean ET. The ufo buffs also believe that secret govt agents try and discredit the phenomena. The paradox is, the ufo groups themselves are so full of lazy, ego driven dumb people, that they actually destroy and marginalise the phenomena because of their ineptitude and claims. You dont need any secret govt group..just allow the same people "involved" to keep wrecking the subject. Why such a profound and truly strange subject, attracts the intellectually challenged sections of society is beyond me.